Near West Theatre holds group auditions in a relaxed and friendly atmosphere. No preparation or preregistration is required. Actors of all experience levels are led through multiple improvisational exercises providing every participant equal opportunity to create through word, movement and song. Auditions focus on the creative process, not the product; on working as an ensemble, not solo. After this first level audition, callbacks will focus on individual roles/songs and working from the script. All individuals should come prepared wearing comfortable clothes to move in, and should arrive 15 minutes early to register. Auditions begin promptly at the designated time. Anyone arriving after the starting time will be asked to audition at the next scheduled time. Long before Hamilton, there was 1776! It’s a long, hot summer in Philadelphia, and the Continental Congress is an exhausted and quarrelsome assemblage, at each other’s throats over the burning question of independence from Great Britain. The nation is on the brink of revolution – if only our founding fathers can agree to sign the declaration! 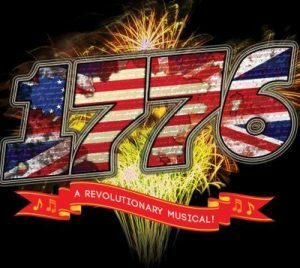 American history blazes to vivid life in this unconventional hit musical, revealing the humor and humanity behind these national icons determined to do the right thing for a fledgling nation. In our modern re-shaping of this hit show, and in the spirit of our mission, casting of characters will be open to all genders, races, and ethnicities.